Shinya Sugiki, international ballroom dancing star, has been teaching Latin Ballroom champion Shinya Suzuki the waltz – in return for coaching in the Latin style. But Suzuki, used to dancing to music, is finding it hard to master the waltz under Sugiki’s strict training regime. Both men, celebrated in their own fields, are determined to master the ten different styles of the 10 Dance which means breaking out of their comfort zone. How will things turn out between them when they return to Japan? Has their dancing improved? Will their partners, Fusako and Aki, notice the difference when all four start to rehearse together again? Perhaps Suzuki is in denial about the undeniable chemistry between the two – but is it just as dancers or is there something more? As the snow falls on a deserted city park, he makes a discovery that may change his life forever. Again, Inouesatoh chooses dance/song titles for her chapter headings, modifying them a little as in Chapter 6 Fly Me to the Dance Competition (based on Fly Me to the Moon) and charmingly explained in her brief Afterword. And another superb translation from Karhys effortlessly conveys the witty exchanges between the two Shinya which get progressively more and more flirtatious. Four superb colour pages at the front are another bonus with this second volume which sweeps the reader off their feet and straight into the heady competitive world of ballroom dance. Inouesatoh’s imaginative use of double page spreads really make the dancers come to life; no mean achievement in a static 2D context. There’s no doubt that drawing a dance manga is a labour of love for this mangaka and she has the graphic skills to pull it off. 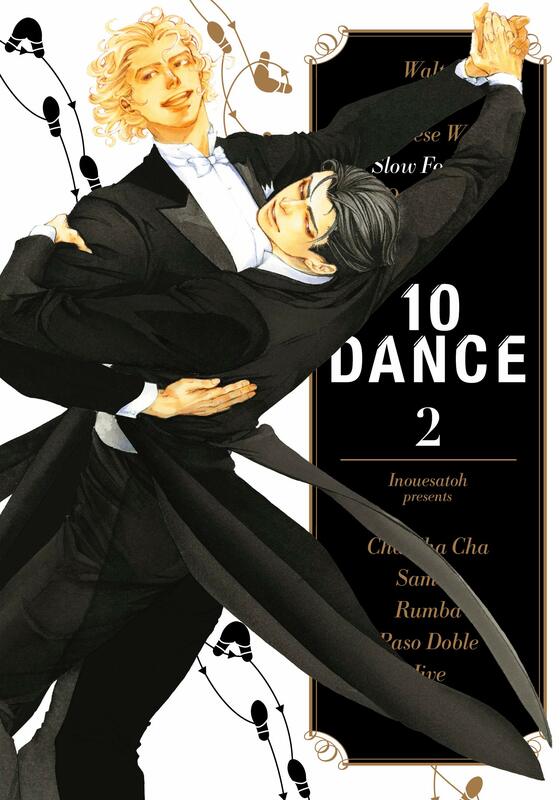 The pleasure in reading 10 Dance is that this is definitely manga for grown-ups. There’s a ve-ery slow burn going on in the nascent relationship between Suzuki and Sugiki and even though Inouesatoh’s love for dance shines through on every page, the interest doesn’t lie in whether the protagonists are winning their way to the top from contest to contest but in the way they value their art. In so many other Boys’ Love manga, they would have fallen into bed together by now…but the mangaka’s interests lie in portraying a relationship that grows from both men’s burning need to dance, where the holds and steps act as a metaphor for feelings yet to be articulated or acknowledged. I can’t wait to see where Inouesatoh will take Suzuki and Sugiki next.